Published on 10 June 2012. 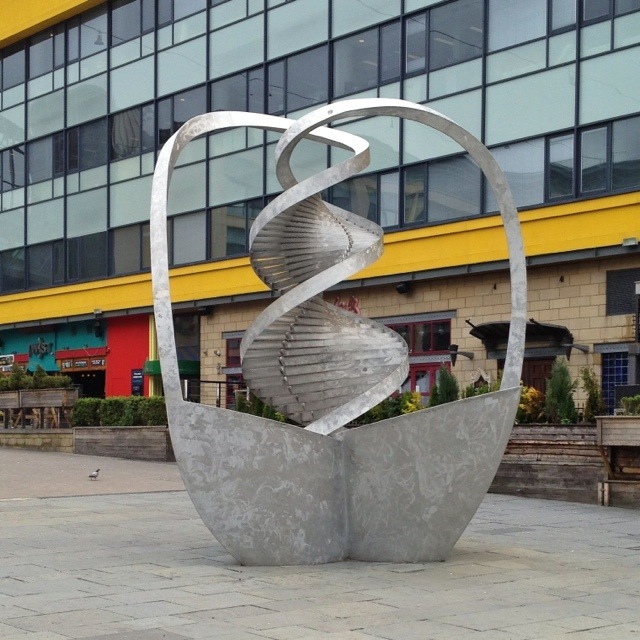 This sculpture of DNA stands in Newcastle’s Times Square, which is the central square of the Centre for Life. The Centre for Life is a remarkable place, uniquely combining world-leading genetic research, NHS fertility treatment, a public science centre, and a series of bars and nightclubs. Times Square hosts an outdoor ice rink in the winter, and frequently has other visiting attractions: the Ladyboys of Bangkok seems to be annual visitors! Today, a Renault Twizy assault course had been marked out – I didn’t give it a go! This 1,682nd post was filed under: Photo-a-day 2012, Art, Medicine, Newcastle-upon-Tyne. Trackback received at 21:56 on 18th June 2012.
sjhoward.co.uk » Photo-a-day 170: Times Square… not quite New York’s!